The inaugural event kicks off in Dallas, identifies key goals for the development of the tech ecosystem. Trey Bowles (second from right) discusses the DFW tech ecosystem during a panel at Techweek on Tuesday. 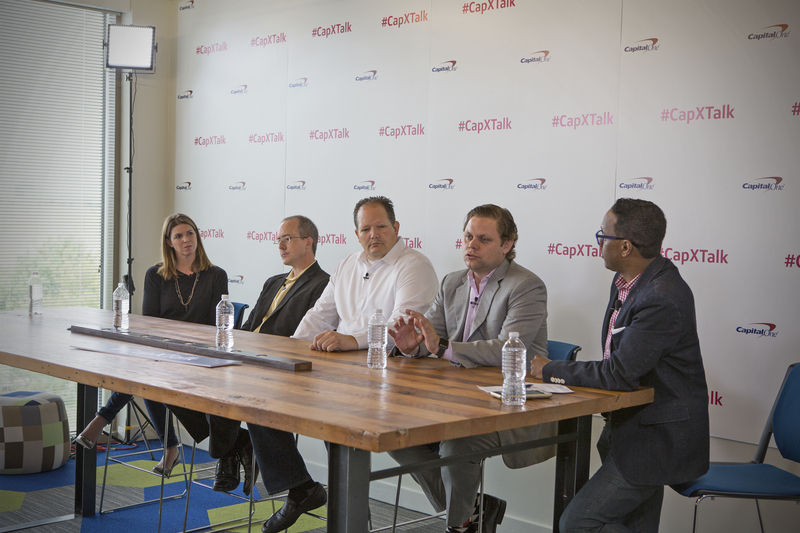 He was joined by Karen Stroup (from left), head of The Garage at Capital One; Daniel Oney, founder of Axianomics LLC; Darold Rydl, founder of PB&J Labs; and Mario Armstrong, digital lifestyle expert on NBC’s TODAY Show. Techweek’s leadership expects to help Dallas-Fort Worth’s technology ecosystem thrive over the next five years. And though Techweek is just in its first year, the CEO of the five-day program has already spotted the challenge for DFW. Techweek, which kicked off its Dallas program Monday, aims to fuel the emergence of large technology companies, which then provide talent, ideas, and spinoffs, aiding the overall ecosystem. It provides programming and networking opportunities in New York, Los Angeles, Miami, Detroit, and Chicago, which serves as its home base. This year, it added Dallas and Toronto to its list. In each city, it commits to providing programming for no less than five years. Techweek, a public benefit corporation, partnered with Capital One, the event’s presenting sponsor, for its Dallas expansion. But Techweek knows from experience that making a substantial mark on the community is not as easy as throwing a big party and calling it a day. It’s about putting the right players together in a room and forcing “uncomfortable realizations” between corporations, advocates, investors, and technologists for an ecosystem to thrive, Signorelli said. And for DFW that means realizing that investments should not only be communicated to the community, but that they should allow for new partnerships. It’s a discussion Techweek hopes to help start, first by gaining the trust of local investors this year, and then by bringing them into the discussion in following years, Signorelli said. North Texas investments in early-stage companies have tended to be spotty, at best, in recent years. But it’s safe to say that in the last five years, the community has seen a few reputable funds and firms dedicate some, if not most, of their investments to DFW companies. Some community advocates say many deals in DFW get done under the radar, as investors want to keep their funds quiet. Others suggest that deal flow just isn’t where it needs to be in DFW to attract and retain its entrepreneurs and startups. But funding is just one piece of the pie, Signorelli said. Techweek aims to create the connections, provide resources, and begin tough conversations that will help bolster the DFW technology ecosystem. If the event evolves into what Yajnik imagines, it will be to DFW what South by Southwest is to Austin. Yajnik jumped on a sponsorship opportunity with the Austin festival two years ago and immediately identified an opportunity to build something similar in DFW. As a result, his company partnered with Techweek, with which it had previously connected for a small-scale event at Capital One a couple of years ago. Yajnik said the two share similar visions of the future and both aim to spur development in the local tech community. Capital One Financial Services has already been working on its own community initiative, Future Edge DFW, to aid in the development of tomorrow’s workforce—a topic Yajnik says he’s passionate about. Techweek’s early indications show that more than 5,000 people are expected to attend the activities in Dallas-Fort Worth. At the end of the the week, Techweek will take all of its intel from the local market and tweak next year’s program based on this year’s findings. How Much Money is DISD Missing Out On by Not Fully Funding Pre-K? Why Isn’t Anyone Using Dallas’ Public Funding for the Arts?